Improve your focus with Eagle Pose. 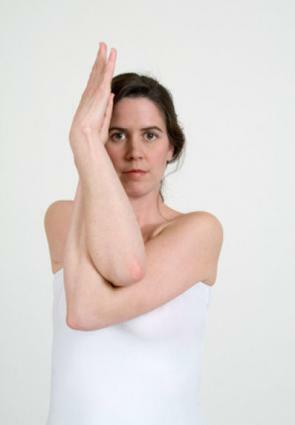 Eagle Pose, or Garudasana, is a terrific pose with which to improve balance and concentration. In Sanskrit, garuda means "devourer" or "king of the birds" and a transporter for the Hindu deity Vishnu. Look closely at the picture and you'll see an eagle's intense gaze. Bend a bit at the knees. Make sure your knees don't go over the toes. While activating the right leg, bring the left leg over and around the right, foot curved around the right calf. Inhale, and on an exhale, lift both arms straight out in front of you at shoulder height. Draw the shoulders down from the ears. Curve the arms at the elbows toward you and at the bend, put the right elbow into the crook of the left arm while twisting the palms to face each other as close as your flexibility allows. Fingertips should stretch toward the ceiling. Hold for 15-30 seconds, and repeat on the other side. Some yogis have a better sense of balance on one side of the body than the other. Keep practicing in even time intervals to improve both sides. For more instruction on Eagle Pose, visit Yoga Journal. Ease into the pose by allowing your outer leg to rest slightly against the inner leg or with the tips of the toes on the floor. If you can't bring your palms together, use a strap for assistance.